So Many Cool Ways to Support the Bob Moog Foundation! The Bob Moog Foundation is an independent 501 (c)(3) non-profit organization. Our projects include our hallmark educational program, Dr. Bobs SoundSchool, through which we teach the science of sound through music and technology, and the preservation of the extensive Bob Moog Foundation Archives. Our funding to deliver these projects comes from donors like you! There are many ways that you can support the Foundation and help strengthen our efforts. Some of them are free or involve in-kind participation. Check them out here! Donations of all sizes provided the resources for us to accomplish our work. Matching Gifts: Donate through your company that participates with matching donations. This often doubles the amount of your donation! Please contact us at info@moogfoundation.org if we need to sign up for your company’s matching gift program! Become a peer-to-peer fundraiser! Join our team of Board members and other supporters to help us raise funding to expand Dr. Bobs SoundSchool. Setting up a peer to peer campaign is easy, as is reaching out to friends and asking them to support you and the BMF with a donation! Please contact us if you have any questions about becoming a peer-to-peer fundraiser at info@moogfoundation.org! Bob Moog Foundation Online Store: Check out all of our cool Moog legacy-related merchandise here including cool Bob Moog Foundation t-shirts, art and educational posters, and more : http://bit.ly/shopbmf!! Amazon Smile  You shop. Amazon gives! 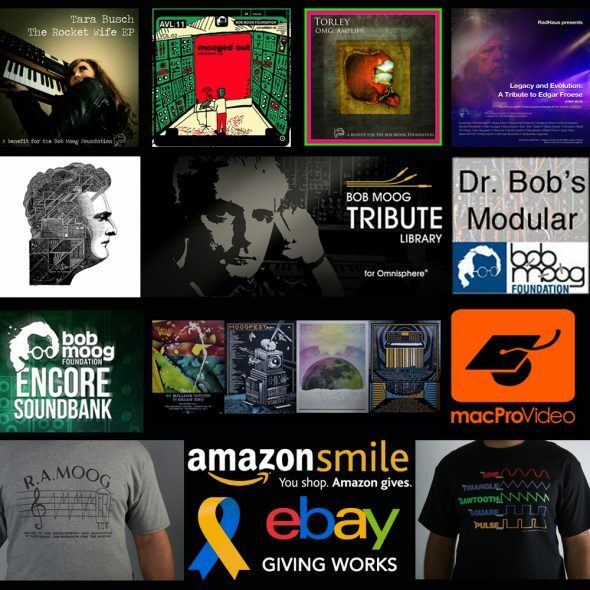 When you shop on Amazon, use this link: http://smile.amazon.com/ch/20-5849794 and Amazon will donate a portion of your purchase to the Bob Moog Foundation, at absolutely no cost to you! What an easy way to do a lot of good! eBay Giving Works: Do you sell on eBay? Consider donating a portion of your sales to the Bob Moog Foundation. We are part of eBay’s Giving Works program. Read more here. Spectrasonics Bob Moog Tribute Library Are you musician? Do you use Omnisphere? Be sure to purchase the Bob Moog Tribute Library, which was created by Spectrasonics and over 45 renowned musicians specifically to support the Foundations important work at the intersection of science, music, and technology. MOTUs Encore Soundbank – MOTU, alongside a multitude of legendary and renowned musicians, created a unique soundbank in honor of Bob, to benefit the Bob Moog Foundation. Learn more about and purchase the soundbank here. Dr. Bobs Modular  Renowned sound designers Drew Neumann and Kevin Lamb worked tirelessly to create a unique sound library from a vintage Moog Modular System 15 synthesizer. These sounds are inspired by the works of pioneering synthesists like Isao Tomita, Wendy Carlos, Larry Fast, and Jean Michel Jarre. Get the details here. Bandcamp Some very cool artists have donated songs or entire albums to the Bob Moog Foundation. Check them out here. Your entire purchase benefits our work! Legacy and Innovation: A Tribute to Edgar Froese  This album, created by various ambient electronica artists from all over the world, and produced by RadHaus, with all proceeds being donated to the Bob Moog Foundation to support our projects. More about this special offering here. Foundation of Synthesis Tutorials – You can find over seven hours of educational videos created by the Bob Moog Foundation on the fundamentals of synthesis through macProVideo and Ask.Audio Academy.